Our amazing U13 CamogieGirls are playing the Division 6 Cup Finalvs Craobh Chiaráin on Monday, 29th October @2pm, Maypark, Malahide Rd. Please get out & support the girls! St. Paul’s were the better team on the day. Despite St. Paul’s having the better opportunities in the first half the game was a draw at half time. Make sure & get out to support the lads in their semi-final vs St Peregrines in Blakestown sun 4th nov @ 11am! Following on from our recent very successful Oneness event in Chicago I want to acknowledge the work of the Committee in arranging the event, in particular Colm Kennedy and Project Manager Sheila Kelly. This was a huge event to organise and administer particularly given the event was held in Chicago. I would also like to thank the Club Members (over 40) who attended the event and represented the Club so well as ambassadors, it was a very proud moment for all involved. We were delighted that both ex-Taoiseach Enda Kenny and Lord Mayor of Dublin Neil Ring were in attendance and presenting such a positive message on behalf of the Club. I am delighted to report that the events over the few days raised in excess of €93,000 which is a fantastic achievement and I would like to thank all those who contributed to the event. Of these funds we will be contributing 10% to both O’Connell Primary and Secondary Schools, 20% will go to the general running expenses of the Club with the remaining amount going towards the development fund and the purchase of the grounds. We hope to place a permanent memory board of the event in the Clubhouse. Any members interested in contributing to the Christmas Shoebox Appeal please drop it to the Clubhouse for the collection on November 9th. Cost will be just €10! Contact GPO Thomas on (085) 113 7728 to book place. Sam Maguire was in Scoil HQ last weekend, and some of our next generation members — perhaps unbeknownst to them! — had the honour of a snap with the coveted silverware, including Chairman Mossy O’Connell’s grand nephew Cillian O’Connell! Congratulations to Dual Stars Adam Wilson & Andy Bunyan for featuring on either side of the Underdogs vs Dubs match in Parnell Park on Friday night, which saw a Dubs team full of eager lads seeking an opportunity to impress just too strong for the TG4 men. It would be easy for us to bury our head in the sand and shy away from recognising what was a very disappointing week on the pitch for Scoil. In seven days the Adult Footballers & Hurlers both crashed out of the Intermediate Championships at the semi-final stage, our Ladies Footballers were beaten in a Cup Final and our Minor Girls were beaten in the Championship Final. But such is sport, and we must take the bad with the good and ensure that we learn from the upsets. There’s no better time than now to take a moment and acknowledge the amazing progress we’ve made on & off the pitch in Scoil over the last number of years with Adult Mens & Ladies teams steadily climbing their way back to the top, second and third teams being established to provide a platform for everyone to get involved, while pushing the ‘first’ teams on, as well as the resurgence of Camogie in the Club, huge advancements in our facilities and a general collectively positive and ambitious attitude. A big congrats to all those involved — especially management & backroom staff — for getting these teams into the position to be able to lament important defeat. Well done to OCS Primary! On getting to the Cumann na mBunscol Final in Croke Park! Hard luck to the O’Connell Primary School lads who were beaten by a strong St Pat’s team, with some individual midfielder magic being the difference, as told by this SportsJoe.ie article on the game. With the majority of the team playing for our Under 11 and Under 12 teams in the Club it’s so promising to see such heights being reached so early on! On winning the Cumann na mBunscoil Final in Croke Park! Scoil Neasain made up mainly of the Scoil UI Chonaill u11s and 13s won their cumann na mbunscoil final against mount merrion with a scoreline of 1.10 to 1.6. After a cagey start the girls came into their own and showed their skills and team play to work easy scores with Sorcha and Sophie the main benefactors. Kate, Roisin and Martha worked tirelessly in front of Alannah who was in goal for the school team to make every score a massive effort for the opposition. But the work was made easier as the quality of ball into their forwards was pressured due to the constant harrying and tackles out the field by Aoife, Anna, Eabha, Sadhbh, Muireanns plural, Liadan Meave. CONGRATS TO JACK & BELGROVE BOYS! On winning the Corn Kitterick in Croke Park! 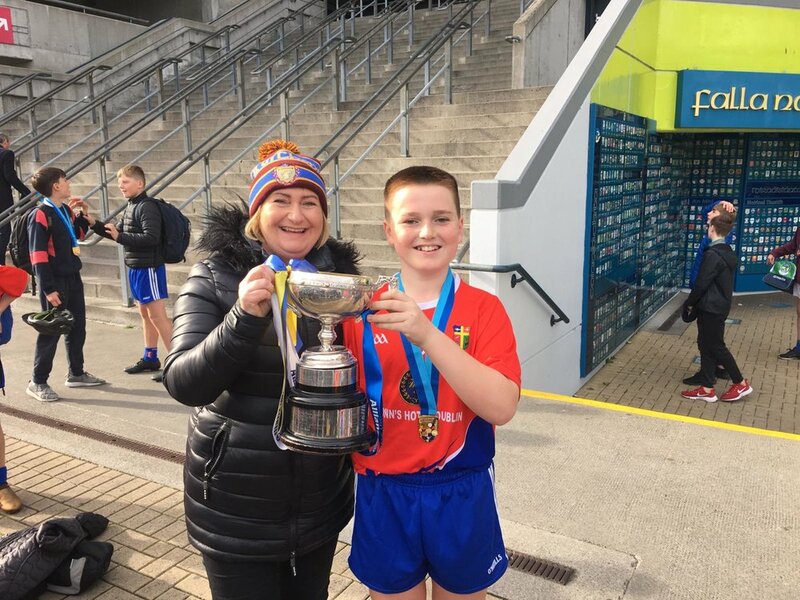 Jack Kennedy, pictured below with mum Ramona proudly sporting Scoil colours, played a pivotal role from corner-forward in his school Belgrove Senior BNS in their Corn Kitterick win in Croke Park. WELL DONE TO Ella & BELGROVE GIRLS! On reaching their final in Croke Park! 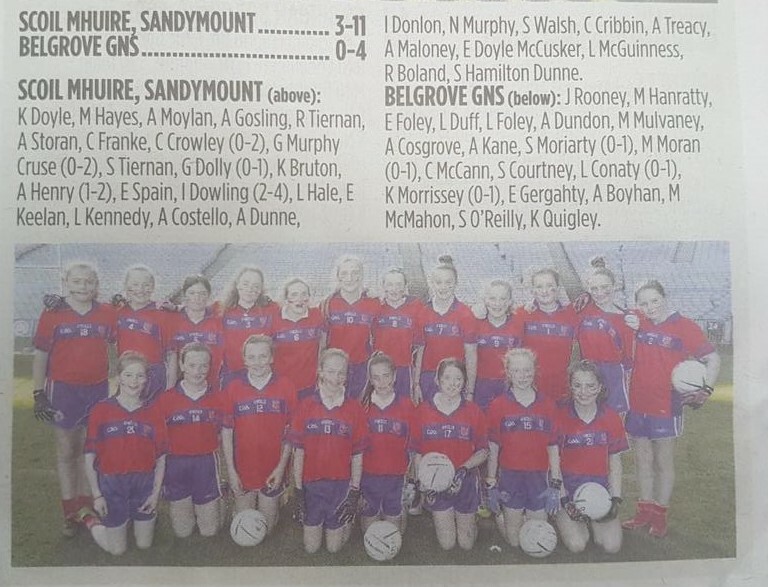 Hard luck to Ella Geraghty who lost the Corn Austin Finn Final in Croke Park with the Belgrove Girls team on Monday. On behalf of my daughters, extended family and I, sincere thanks to all of you who sent their condolences & sympathies since Jean’s passing. Those of you who visited our home, attended the funeral service, sent emails, texts, letters, cards and the heart-warming tribute paid to Jean in the Club notices, all the stories retold, the hugs and handshakes received, they have helped us all get through those initial days of grief and the past few weeks. Particular thanks to TJ and Mossy, who attended as pallbearers on the day. They represented all the good friends past and present Jean made in Scoil Ui Chonaill over the years and all the good times had. She would have been very proud. Please provide a brief synopsis of this group. Walking club started Easter Saturday. It’s mainly a social gathering of all ages of present and past members good fun nothing to strenuous. A bit of a slow burner but we will get there! In the Club. Been on a summer break hopefully another walk in 2 weeks. Elder lemon’s but young at heart. Having a lovely cup of coffee / wine after our first walk it was a very cold day. Also hard luck to our Minor Girls were beaten in the Championship Final. Minor Boys seal place in semi-final with win over Whitehall. St. Paul’s were the better team on the day. Despite St. Paul’s having the better opportunities in the first half the game was a draw at half time. Playing with breeze in the second we took some good scores and built a good lead. A few lapses in concentration gave Whitehall some late scores which made for a nervy ending. David Kennedy put in a man of the match performance scoring 8 points. Good performances too from Jake Prendergast in midfield, Sean Downes, Josh Fitzpatrick & Adam Nolan at half back & Peter Cronin at full back. David Kennedy 0-8 (5f), Jordan Dunne 1-1, Robert McBride 1-0, donal Mckay 0-2 (1f), Sean Downes & Eoin Sterio 0-1. Semi final v st peregrines in Blakestown sun 4th nov @ 11am. The U14 ‘s had a tremendous win in St. Annes Park last Saturday evening, they put up a large score against a team they just barely beat last year which indicates the progress this team has made in the last year. It was the last match of the season and they finished top of the split league. Monday night training has paid off in abundance. The boys played an away hurling game against Na Gaeil Oga GAA Club on a beautiful sunny Saturday morning in St Catherines Park in Leixlip. Given the numbers available from both teams we played a 12 a side game on a larger pitch. Whilst this made for a good open game with plenty of space available it made for a low scoring game as even our big hitters had a long distance to cover. It was an even enough game in terms of standard and possession of the ball with Scoil winning narrowly by two goals to one. Both goals came from the man of the match Eoghan Og. Our new recruit Rys did well in goals with some great puck outs. The defence of Isaac, Cillian, Paddy and Senan presented a very strong back line making it hard for the opposition to get any time on the ball. The midfield of Eoghan Og, Luke, Jake and Michael won a lot of ball in midfield and supplied plenty of ball for the forwards Evan, Temi, Ruairi and Callum. Temi showed some great skills picking up the ball in some very tight situations even with the referee being a bit harsh on some of his pickups. As well as the scores we did put a few point opportunities wide when put under pressure. Whilst it is great to be getting in the position to score points a bit more accuracy in front of goal would have given us a bigger win. Team work, skills and competitiveness on the pitch are improving every week which is great to see as the team develops. We had one of our best turnouts for an away game on Saturday with 27 enthusiastic U9 players turning up at Naomh Mearnóg. Playing against such formidable opposition was a fantastic opportunity for our players to put into use what they’re learning when practicing at home and also at Clontarf Road on Mondays and Wednesdays. In keeping with the spirit of Go games, no score was kept on the day. However, all three of our teams went home very happy. Saturday’s performance was a just reward for the incredible effort the boys have been putting in during training. The improvement in hurling skills, team work and game awareness since our first hurling league match on 24 February is quite amazing. For the Red team Cody had a terrific game in goal and made a number of important saves. The coaches were pleased that he always looked up to find players in space and delivered long, accurate puc outs that put us on the attack. Noah set an example for the team by getting stuck in with some super tackles and doubling on the moving ball which is a difficult skill to master. He took several knocks but kept coming back with even more determination. Sam had another fine game and kept close to his opponents to prevent them from lifting the ball. He also made some super long clearances by keeping his head down and following through with his swing. The Amber team put in a superb performance mixing grit and flair. The development of the team over the year was really in evidence, with all players trying to jab lift, backs disciplined in their marking and strong tackling throughout. Oisín was a giant at the back winning every 50/50 challenge and ably assisted by long clearances from Conall and Rían. Eoin in goal pulled off one great stop on the line then lifting it and lashing the ball out under pressure from three Mearnog forwards. Meanwhile Brodie, Joseph and Rory were ruling midfield, each showing their ability to strike from the hand. One thing to work on was the lack of the killer touch in front of goal but overall it was a great team performance. The blue team showed great fighting spirit and terrific skills from the start. Not one player gave an inch and every ball was contested. Darragh showed that he has been practicing his air hurling at home and did some excellent striking by keeping his eye on the ball and following through to drive the sliotar a long distance. Zach had another super game and kept getting close to his opponents to tackle and clash. Hugh did a number of perfect jab lifts and, just like we have been practicing, took 4 steps before striking the ball. The U9s were treated to a night at the circus on Friday night! The coaches’ attention is already turning to 2019! We believe that we have the makings of a super squad, but have room for a few more players. No other official fixtures due to Bank Holiday weekend. Enjoy the break everyone, and please get out & and support the Girls!